Perfect timing and extreme temperatures mix to make this amazing series of photographs in which you can watch hot liquid instantly turn into dramatic ice plumes in midair. 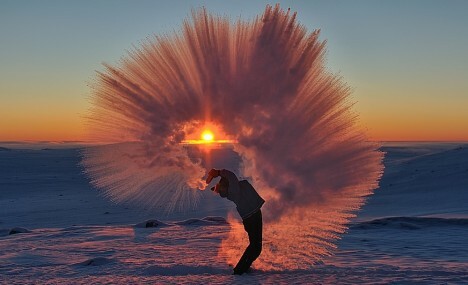 Michael Davies, a photographer from Canada, took pictures of his friend throwing out a thermos full of tea in Pangnirtung, a remote spot in Canada’s High Arctic (only a dozen miles south of the Arctic Circle). With just a few hours of daylight during the winter, and temperatures down to and below negative 40 degrees (fun fact: that’s the same in Celsius or Fahrenheit! 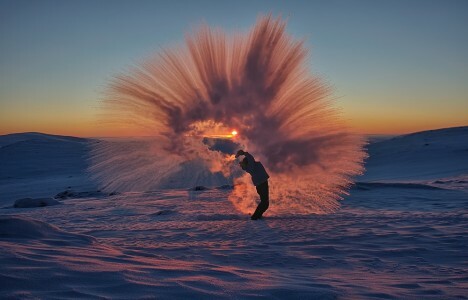 ), there are few better places for such an insanely frigid photo shoot. See more in Weird Science or under Science. February, 2016.